I originally had From Hell earmarked as part of my Halloween Marathon, but I just never got around to it then and the DVD has been sitting next to my TV ever since. Well, I'm currently reading Madame Xanadu, Vol. 1: Disenchanted, and one of the stories is about Jack The Ripper. So, it seemed the perfect time to revisit From Hell once again. It's been a long time since the last time I watched this and didn't remember much of it at all with the exception for a couple of scenes. This is a movie that I had high hopes for. I never read the Alan Moore comic, but knew of it being critically acclaimed. It is after all by Moore. As for the film, with Johnny Depp, Heather Graham and The Hughes Brothers, I figured this would be a knock out from the very first scene. Visually, the film is stunning to look at and I didn't have any problem with their abstract scenes painting a picture of what Abberline (Depp) is seeing in his mind's eye. I thought Depp did a pretty good job. But Heather I think was not used properly in this one at all and the Hughes should have definitely fleshed out the "Romance" that they were trying to build. It just felt very underdeveloped, which also can basically describe most of the movie as it does seem rushed in places. Ian Holm as Sir William Gull does shine whenever he is on screen and does keep the movie together in spite of some flaws throughout the rest of the film. This is a work of fiction and should not be taken seriously. Pure speculation who may have been Jack The Ripper. Worth a Rent if you like Thrillers or dark and macabre films. So, did the guide give an oral presentation as well? My guess is that he or she mentioned some of the well-known "suspects". I forgot to mention in my review that one of the cool tie-ins into the movie was the appearance of Joseph "John" Merrick, better known to the world as The Elephant Man. 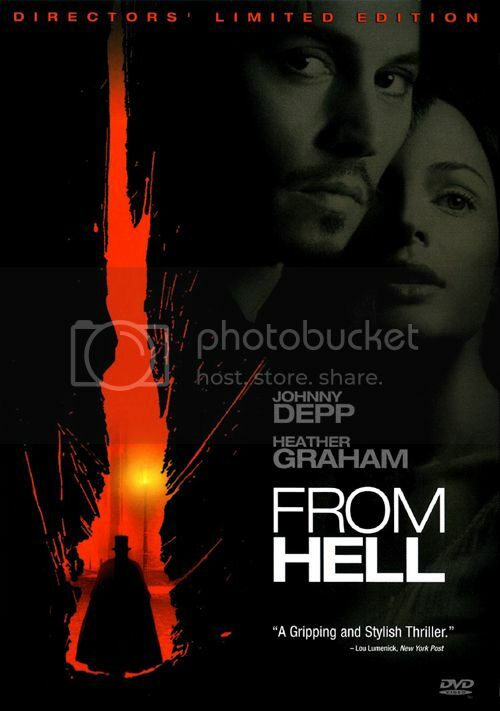 The movie of the same name is just an amazing tour de force of acting by John Hurt and seeing the 'character' in From Hell, it was as if John Hurt himself was in the movie as well. I definitely need to revisit the movie as I haven't seen it in probably 15 years if not longer. I've never seen The Elephant Man. Still need to. I'm gonna see if I can get it from the Library sometime this week. Meaning what? Your Library is saying you have a long wait for a copy? Well, Netflix, but yeah. Although I'm smack dab in the middle of an online class and don't mind waiting.